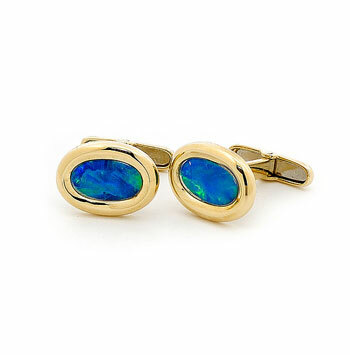 This 14k Yellow Gold Light Opal Doublet Cuff Links are the finest indulgence in jewellery for men. The pair of matching Australian doublet opals measure 10mm x 6mm in dimension and are sourced directly from renowned opal mines in Coober Pedy, South Australia. Our jeweller then craft them into a classy 14K yellow gold bezel setting. The perfect gift idea for men who appreciate the uniqueness of this Australian treasure.